[Guy] wrote in to share this motorized camera lens project he recently finished. He really loved the zoom lens, but since both zoom and focus are manually controlled, he sometimes had trouble getting both set to the right place in time to take the shot. With modern DSLR cameras which allow video capture, he also wants to have the option of a smooth zoom that is always in focus. The solution was to add motors to the rings and control them with a Wii classic controller. This hack really shines when it comes to the add-on hardware. He has some beautifully made rings which wrap around the focus and zoom rings on the lens. They are then held in place by a timing belt. These belts have teeth which key into the gears on a pair of servo motors. From there it’s a snap to drive the motors with an Arduino, connecting to the Wii controller with a breakout connector. You can see [Guy] showing off the build in the clip after the break. 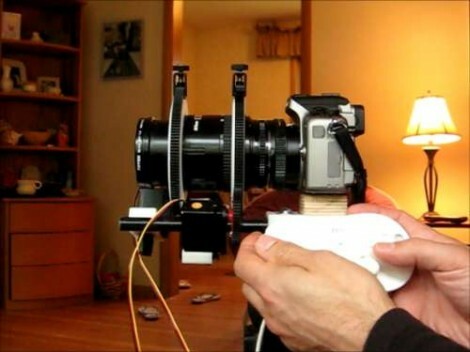 I’ve seen motorized lens builds in the past but this is very well done, I think the wii classic controller could be done without, but otherwise it’s solid looking and seems to transact through zoom levels smoothly. I would like to point out that the rings and timing belt are both commercially available products for anyone who wishes to replicate this. Search for Follow Focus. @Punkguyta: Thanks for the props – much appreciated! And I agree that for some purposes, you could do without the Classic controller (for example, if you just wanted knobs to control focus and zoom positions). However, I should explain that my primary reason for building this is to get smooth, variable zooms that stay in focus when I’m shooting dance performance and sports videos. For those reasons, I need at least one joystick to give me variable speed control over the zooming action. And to keep the manually-focused lens in focus when I’m zooming, I also need to be able to be able to quickly focus a “focus at max zoom” and “focus and min zoom” setting so that my controller code can calculate the ratio between Zoom and focus steps which is then used while zooming in order to keep the lens in focus as I zoom in and out. It also gives me 6 more buttons that can be used to program “goto” zoom/focus positions that can be recalled with the push of a button. While this could have all been done with buttons connected to different Arduino inputs, the Wii controller requires only 2 input pins to enable 2 joysticks, and basically 12 buttons. So for my purpose and for this advanced functionality, using the Classic ontroller made more sense than just wiring up a couple of potentiometers and a bank of push button switches. Is it possible to control two lens in sync with one controller for shooting 3d stereoscopic video with Canon 7D cameras ?